Lubrication is the lifeblood of any high-performance engine. That’s particularly true for the rotating assembly that absorbs the many thousands of pounds of combustion pressure and converts it from reciprocating motion to rotary motion to drive the vehicle. Straight shot oiling plays a major role in that brutal environment. Here’s why. 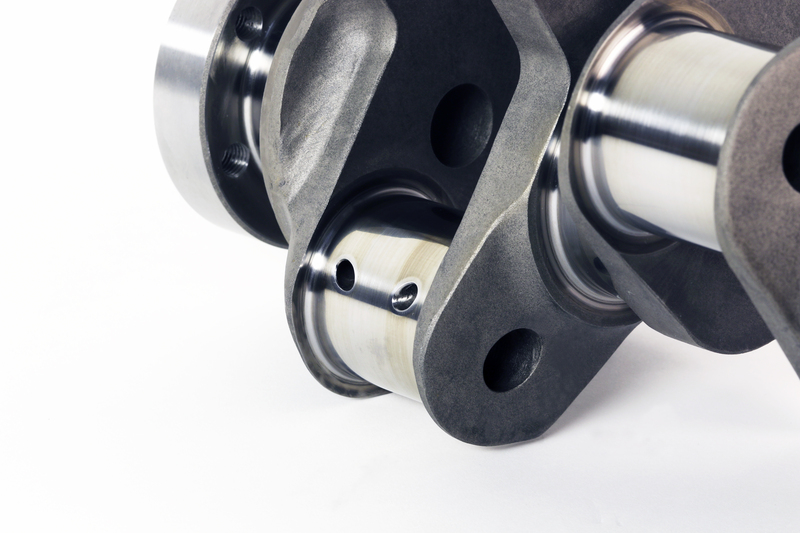 Main bearings and connecting rod bearings must have a constant supply of fresh clean engine oil to do their job correctly. Anything less means instant catastrophic engine failure. Engine builders devote considerable effort to ensuring a steady supply of cool unaerated engine oil to the rods and mains in high-performance or racing engines. Keeping a race engine alive requires adequate lubrication! The connecting rods and main bearings, some of the most stressed components in an engine, cannot live without proper oil pressure even for a brief moment. A hallmark of all aftermarket high-performance and racing cylinder blocks is a priority main oiling system. A priority main system provides a direct oiling passage from the main oil gallery to each main bearing. This ensures that the main bearings and subsequently the rod bearings get oiled before any top end oiling takes place. Once the mains are adequately lubricated, additional passages in the crankshaft route oil to the rod bearings where the real combustion pounding takes place. That’s where the benefit of straight shot oiling comes into play. In the same sense that priority main oiling provides a direct shot of oil to the mains, straight shot oiling in the crankshaft provides a direct shot of oil from the mains to the rod bearings so they are never starved for oil. This wasn’t always the case. In the fifties and sixties racers felt that cross-drilling an additional hole straight through the main bearing journals would lubricate the bearings better, but they forgot about the rod bearings. This probably stemmed from a misguided effort to fix an oiling problem caused by improper clearances, high volume oil pumps or bearings that were not originally designed for the stress of a racing application. It caused all kinds of lower end problems. The welding rod passing through the journals shows the straight-shot path from the main journal to the rod journal. 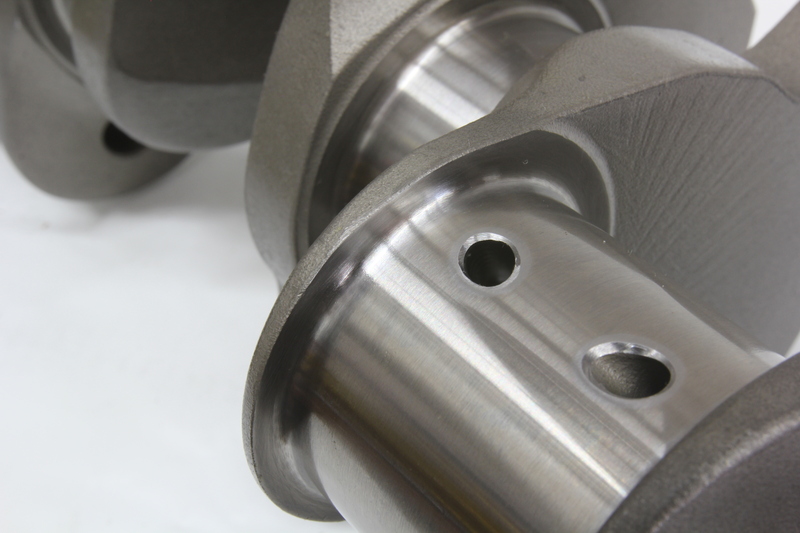 Normal engine speeds were not particularly affected by this modification, but it was quickly discovered that higher engine speeds caused a cross-drilled crank to actually centrifuge the oil out of the main journal lubrication surface, preventing it from flowing freely to the rod journals. Early oil pumps did not make enough pressure to overcome the centrifuge effect and the rod bearing suffered the consequences. Rod and crankshaft failures were quickly traced to this problem, yet some manufacturers were still cross drilling cranks well into the seventies and what’s worse, some people still believe in the idea. This view shows how each main journal feeds an adjacent rod journal on either side of it. 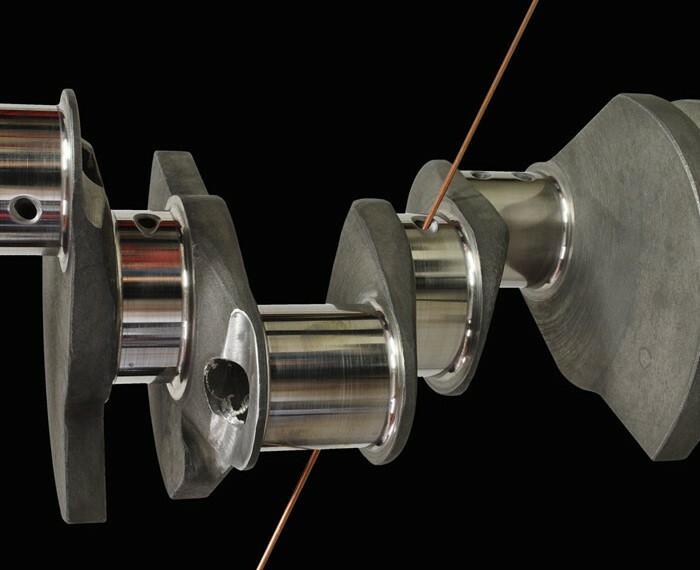 Modern high-performance and racing crankshafts all incorporate a “straightshot oiling” strategy. The rod bearings receive full pressure oiling through a straight passage from the mains directly to the rod journals and the main journals are not cross drilled. The accompanying photo illustrates how this works by inserting a length of welding rod through the passage from the main journal to the rod journal. The oiling passage is a straight shot and since the crank is not cross drilled, oil is forced to follow the direct path to the rod journals. If you picture the rod and main journals from an end view you can relate oil flow to where the passages are clocked. When the crank throw is at twelve-o’clock oil enters the main bearing between six and nine o’clock depending on the journal size and stroke length. The straight shot oil passage is offset from center and feeds directly to the rod throw. It exits at approximately two o’clock ahead of the point of maximum loading. Hence engine speed has no adverse effect on oil delivery to the rod journal and the rods receive the same vital lubrication as the mains. Oil is fed to each of the main journals through passages in the block. After oiling the mains, oil pressure is directed through the straight-shot oiling to each of the rod journals. 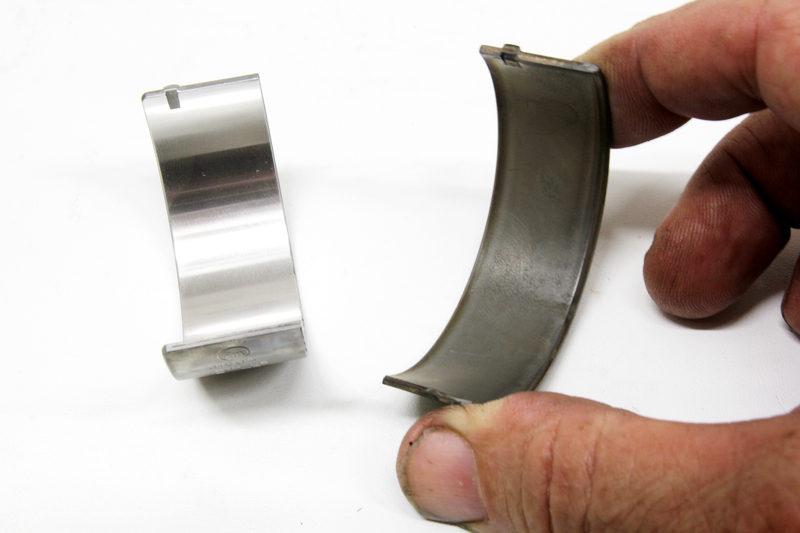 The crankshaft is supported by a very thin film of oil on babbit-style bearings such as these. The minute amount of oil film requires perfect oil pressure for the crank to survive. Many engine builders are beginning to lean back toward tighter clearances. That means the minimal oil film on the rod journals must have full pressure behind it to maintain full lubrication under the heavy pounding it absorbs. They are also moving to synthetics and lighter weight oils, all of which requires optimum integrity of the oil film on each rod journal. 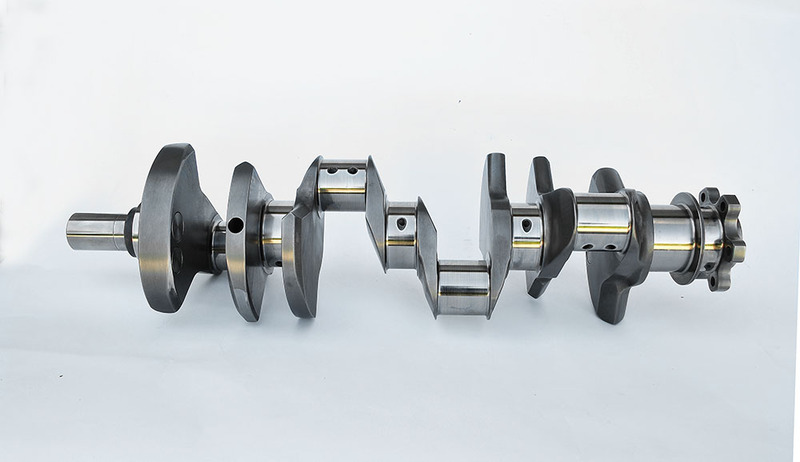 Straight shot oiling provides the solution and it is available on all modern crankshafts like those provided by K1 Technologies.